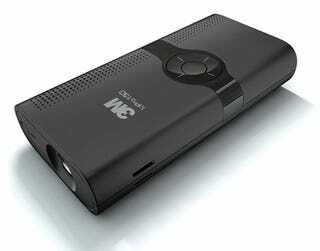 3M only updated their pico projector range last August, claiming it was their "second generation" model. Meet their third-gen pico: the MPro150. The resolution is still just VGA quality, but there's now 1GB of internal storage. There aren't as many changes between the MPro120 and the MPro150, though the lamp is now 15-lumens. A microSD card slot and USB input are alternatives to the 1GB of internal memory, and Office applications along with Adobe PDF, photos and the usual video are able to be displayed. Integrated stereo speakers just like the MPro120 are also squeezed on.